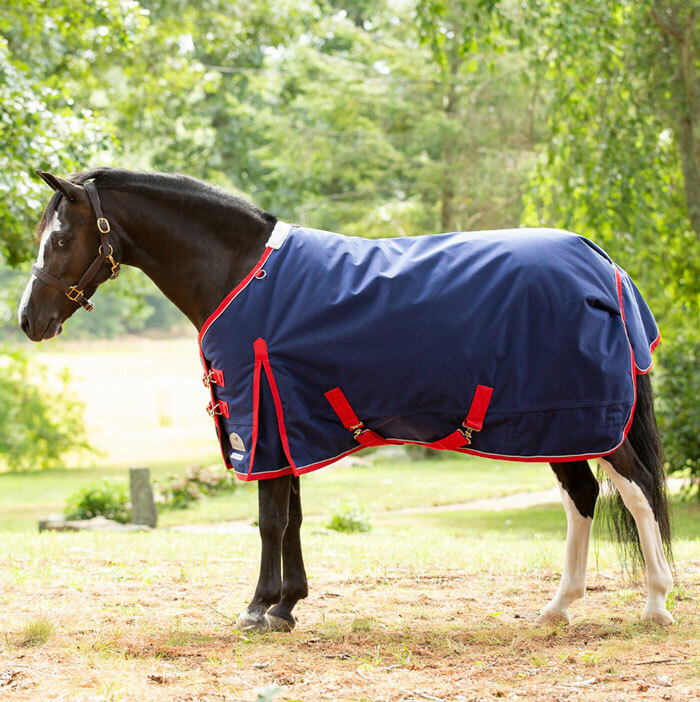 A horse sheet is lightweight and has no fill, whereas a horse blanket has filling to keep your horse warm. They come in two varieties: turnout and stable. Turnout sheets and turnout blankets are waterproof and designed to be worn when your horse is outside, while stable sheets and stable blankets are not waterproof and meant to be worn when your horse is inside. Choosing between these types can be overwhelming, but we’ll take a closer look at the differences here to help you ensure that your horse’s wardrobe is properly stocked. You have a variety of outerwear in your own wardrobe because you need options based on whether it’s rainy, snowy, or too cold to even be outside—and your horse should, too! While there are a whole variety of types of horse clothing, we’re going to focus first on two key factors – the level of warmth and the presence (or absence) of waterproofing. When it comes to understanding the importance of warmth, a surprising analogy can help – your bed! Think of the items you use to “dress” your bed – the sheets are very thin and provide little in the way of warmth. Blankets, on the other hand, are bulkier, cozier, and keep you warmer. The same is true for dressing your horse! Horse sheets are thin and lightweight, while horse blankets provide considerably more warmth. And just like the ones on your bed, horse blankets come in different thicknesses or amounts of warmth. 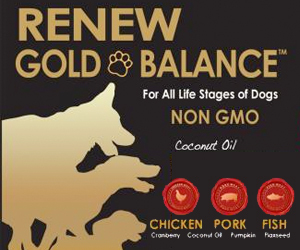 This is the element where your horse is not like you. While you might be fine outside on a clear day in a sweater or sweatshirt, if your horse is going to be outside, it’s best to use a waterproof outer layer. That’s because if your horse lays down on ground that looks dry, his blanket or sheet can still absorb moisture and when that damp blanket meets cold air, it can end up making him chillier than he was without the blanket or sheet in the first place! In a very helpful naming convention, stable blankets and stable sheets are not waterproof and are intended to be used indoors, as their name implies! Turnout blankets and turnout sheets, on the other hand, are waterproof and safe for use inside and out in the turnout or pasture. In addition to being waterproof, turnouts also tend to have a heavier denier, which means they’re tougher and can stand up to outdoor elements, like rough ground (or rough pasture mates!). Horse blankets are constructed in three layers: the lining, the fill, and the shell. The lining, which is typically made of cotton, poly-cotton, nylon, or mesh, reduce friction and can even help smooth and polish your horse’s coat. The fill, or “stuffing,” is what keeps your horse warm. As we described earlier in this guide, blankets can have anywhere from 0 to 300+ grams of fill, depending on what amount of warmth they’re intended to provide. The shell, which is the outermost layer of the blanket, is what protects your horse from the elements. One, two, or three surcingles cross under the belly, securing the blanket in place. More surcingles = more secure fit. Shoulder gussets offer a bit more “give,” allowing greater freedom of movement. A tail flap offers full wind and rain protection for horses who spend a lot of time outside. The bottom of the flap should reach the middle to the end of the tailbone. Optional nylon or elastic leg straps help prevent shifting and keep the blanket secure in windy weather. For safety and security, these straps shouldn’t hang loosely. Loop them through each other to help avoid rubs. 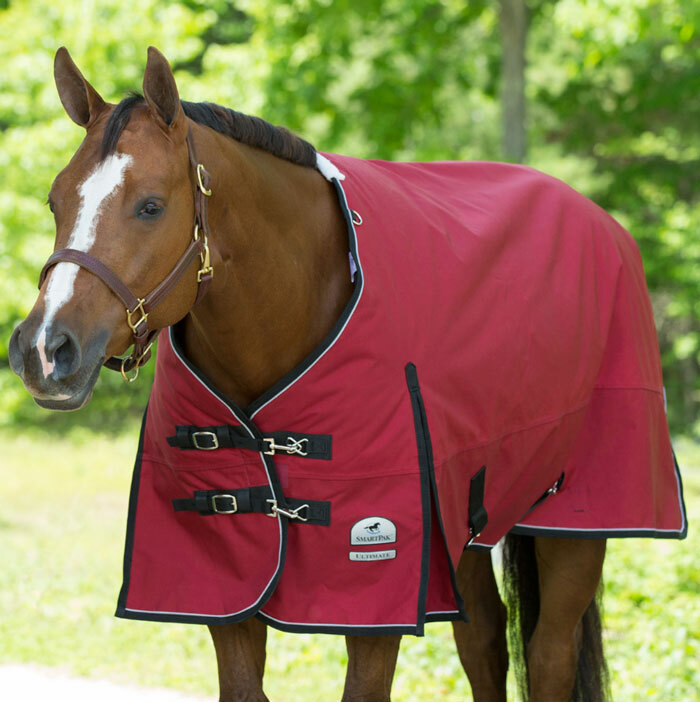 Hoods and neck covers are separate pieces designed to attach to the turnout blanket for more complete coverage. Stable Sheet– The stable sheet is the piece of apparel people are usually referring to when they simply say “sheet”. Usually made from cotton, poly/cotton, nylon or canvas, stable sheets are designed to keep the coat clean and provide a light layer of warmth. Show Scrim– Scrims are extremely lightweight, open-weave sheets designed to keep your horse clean ringside at shows. Usually made from poly/cotton or nylon fabric and embroidered with the horse or barn name, scrims are generally considered to be more about style than function. Anti-Sweat Sheet– Similar to scrims, anti-sweat sheets have an open-weave that increases breathability and reduces sweat build-up. They are usually made from 100% cotton or a poly/cotton blend to help wick away moisture. Anti-sweat sheets are a great option after summer rides when you want to keep your horse clean while he cools out. Fly Sheet– Designed to protect your horse from pesky bugs, fly sheets are lightweight, breathable and durable enough to withstand turnout. Some fly sheets offer UV protection, while others may be treated with insect repellants for extra bug-blocking power. Rain Sheet– Rain sheets offer waterproof protection for your horse and your tack. They’re great for horse shows or stables where the indoor is not attached to the barn. Traditional rain sheets cover the horse from the poll to the top of the tail, however they’re not very secure and therefore not recommended for use in turnout. Dress Sheet– Dress sheets are finely crafted fleece, wool or wool blend sheets that offer both style and functionality. They keep your horse cozy (and looking fabulous) on chilly horse show mornings, wick away moisture when he’s cooling out and can be used as blanket liners for extra warmth in particularly cold weather. Quarter Sheets – Usually made of fleece or wool, quarter sheets are designed to cover your horse’s hindquarters and wrap up under the saddle flaps or over your legs when you’re riding. Many riders prefer to use quarter sheets just for the warm up, while others keep them on for the entire ride, especially during long, cool-weather trail rides. Coolers – Coolers come in two styles: square and fitted. Square coolers are oversized and loose, draping over your horse from the poll to the top of the tail and hanging just below the belly. Fitted coolers are snug-fitting, like stable sheets, and the term “fitted cooler” is often used interchangeably with “dress sheet”. Regardless of the cut, coolers are made from fleece or wool that draws moisture away from the skin while trapping heat; helping to keep horses warm and dry, not cold and clammy, as they cool out after winter riders. Stable Blankets – Stable blankets are similar in style and material to stable sheets, but unlike sheets, blankets are filled, like the comforter on your bed. They come in a range of weights, offering different levels of warmth so that you can dress your horse according to the weather. Because the exterior material is not waterproof, stable blankets are generally used when the horse is in the stall. For waterproof protection, some owners will layer a turnout sheet over their horse’s stable blanket when the horse is outside. Weight/Fill – The weight of a blanket refers to the amount of fill, or “stuffing”, which is measured in grams. A lightweight blanket (aka “sheet”) has 0g or no fill. Medium-weight blankets have anywhere from 150-225g of fill. Heavyweight blankets have 250-370g of fill, with a few ultra-heavyweight blankets weighing in at 400g of fill. Denier – Denier is the measure of nylon fiber density, and is used to rate the strength of the exterior material on horse blankets. Like fill weight, denier varies greatly from one blanket to the next. A higher denier, like 1200D, indicates the blanket is more durable and more water-resistant than a lower denier, like 600D. Rip-Stop – Rip-stop nylon features a checkerboard weave that helps prevent small rips from spreading, so you can patch a small hole instead of replacing the entire blanket. Ballistic – Ballistic nylon was originally developed for use in bulletproof vests. Ballistic nylon turnout blankets won’t stop bullets, but they will put up with a lot of abuse. Lining – Because the exterior material is often quite rough, in order to stand up to the elements, many blankets have liners that are softer against your horse’s skin. Cotton or poly/cotton linings are absorbent, nylon linings help polish the coat and mesh linings enhance air flow and moisture management. High Neck – This style of turnout blanket is cut significantly higher up on the horse’s neck, offering extended protection from the elements. Neck Rug/Neck Cover – These separate pieces are made from the same material as turnout blankets, and are designed to attach to the turnout blanket for more complete coverage. 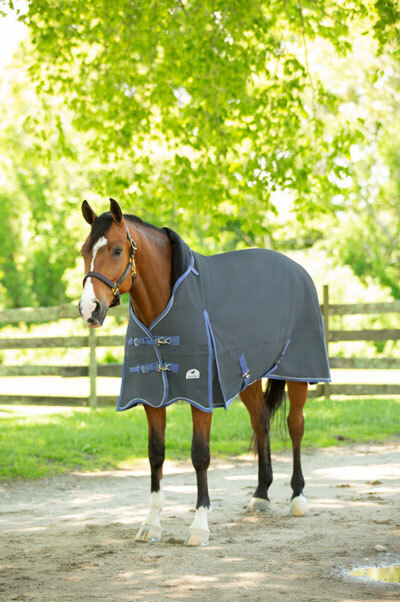 Many owners use neck rugs to adjust their horse’s level of protection and warmth as the temperature fluctuates. Hood – Like neck rugs, hoods are separate pieces that can be used for extra warmth. Unlike neck rugs, hoods are made from the same material as stable blankets and cover the horse’s face, as well as the neck. Buckle-Front – Just like a regular belt buckle, usually nylon straps with a metal buckle. Offers a lot of adjustability. Surcingle – Also known as “T-locks”, surcingle closures on the front of the blanket will function just like the belly surcingles, with two metal pieces that interlock to keep the blanket closed. Quick-Clip – Any metal snap or clip fastener that you can open and close with one hand. Really “handy” to have if you’re taking blankets on and off repeatedly. Easy to use with gloves, which is a big plus in the winter! V-Front – Usually cut a little higher on the neck, V-Front blankets fasten lower on the chest, eliminating pressure when the horse has his head down. Closed Front – Closed-front blankets have no opening in the chest, so they’re taken on and off over the head. The smooth, streamlined fit helps eliminates bunching and rubs. Shoulder Gussets – Gusseted blankets have an extra piece of fabric sewn in at the shoulder, to allow for great range of motion. Padded Withers – Fleece or foam padding at the withers can reduce rubbing, a common problem for many horses. Leg Arches™ – With Horseware Ireland’s patented Leg Arches™, the edge of the blanket is cut back around the legs to allow for movement without interference or rubs from the blanket. Surcingle – The belly strap(s) that is primarily responsible for keeping the blanket in place. Sheets and blankets can have anywhere from one to three surcingles, with two being the most common. The more surcingles on the blanket, the more likely it is to stay in place. Leg Straps – These straps criss-cross between the horse’s back legs, providing stability, preventing the blanket from riding up or shifting out of place. Tail Flap/Tail Cover – An extra swatch of fabric that covers the tail area, usually to the bottom of the tail bone, to help seal out cold winds. Tail Cord – This cord ties the back ends of the blanket together and rests under the tail, helping to keep the blanket in place.